Desde hace décadas los fabricantes vienen realizando intentos para entregarnos un buen T-55. Al principio fue Esci, y parecía que era una buena maqueta. Pero con el correr de los años las exigencias de los modelistas aumentaron, y esa maqueta solo sirvió como base para corregir y superdetallar. 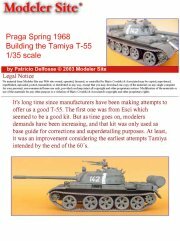 Por lo menos era una mejora sobre los primitivos intentos de Tamiya de fines de los '60.. 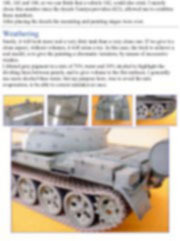 It's long time since manufacturers have been making attempts to offer us a good T-55. 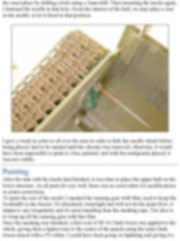 The first one was from Esci which seemed to be a good kit. 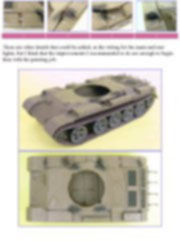 But as time goes on, modelers demands have been increasing, and that kit was only used as base guide for corrections and superdetailing purposes. 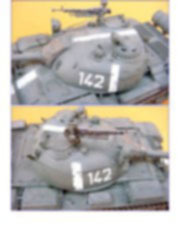 At least, it was an improvement considering the earliest attempts Tamiya intended by the end of the 60´s. 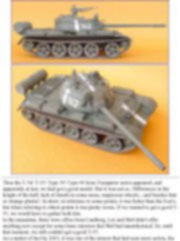 Then the T-54/ T-55/ Type 59/ Type 69 from Trumpeter series appeared, and apparently at last, we had got a good model. But it was not so. Differences in the height of the hull, lack of details in some areas, suspicious wheels....and besides that so strange plastic!. In short, in reference to some points, it was better than the Esci's, but when referring to others points it was pretty worse. 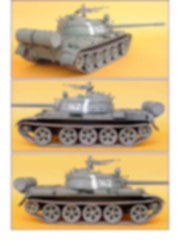 If we wanted to get a good T-55, we would have to gather both kits. In the meantime, there were offers from Lindberg, Lee and Skif didn't offer anything new except for some basic interiors that Skif had manufactured. 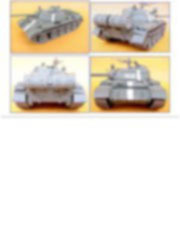 So, until that moment, we still couldn't get a good T-55. As a matter of fact by 2003, it was one of the armors that had seen more action, the one used by dozens of countries during almost 50 years and while, many versions of Panthers and Tigers appeared unceasingly, this armor was not worthily represented. Finally, after several years and different attempts, the definitive T-55 arrived. 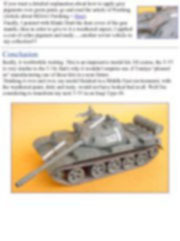 Although some things can be improved ( as we'll see later in this note), it would have no meaning that other manufacturer offered a new T-55 to compete with the Tamiya's, The one I have over here, is already good enough. 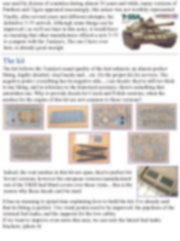 The kit follows the Tamiya's usual quality of the last subjects: an almost perfect fitting, highly detailed, vinyl tracks and…etc. It's the proper kit for novices. 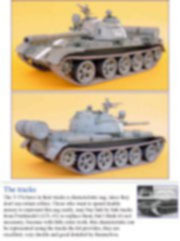 The negative point ( everything has its negative side....) are decals: they're still too thick to my liking, and in reference to the historical accuracy, there's something that astonishes me: Why to provide decals for Czech and Polish versions, when the meshes for the engine of this kit are not common to these versions?. 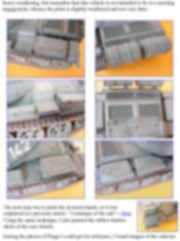 Indeed, the vent meshes in this kit are open, they're perfect for Soviet versions, however the european versions manufactured out of the URSS had blind covers over these vents... this is the reason why these decals can't be used. As I supposed, by the time this kit was being offered, a gallery of models representing different vehicles such as the used in the Middle East, would appear sunburned, rusty, roughly used, weathered and painted over and over in different sand colors. I admit that they're very attractive vehicles, but I intended to give to my T-55, a different look. I wanted to make a vehicle with little weathering, with no broken parts or rust, painted in the traditional Soviet green. I really wanted to highlight its shapes, not its weathering. 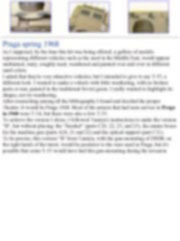 After researching among all the bibliography I found and decided the proper Theatre: It would be Praga 1968. Most of the armors that had seen service in Praga in 1968 were T-54, but there were also a few T-55. 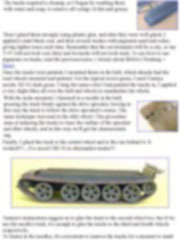 To achieve the version I chose, I followed Tamiya's instructions to make the version "B", but without placing: the "Snorkel" (parts C20, 22, 23, and 25), the ammo boxes for the machine gun (parts A20, 21 and 22) and the optical support (part C11). 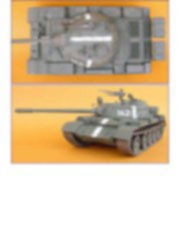 To be precise, this version "B" from Tamiya, with the gun-mounting of DSHK on the right hutch of the turret, would be posterior to the ones used in Praga, but it's possible that some T-55 would have had this gun-mounting during the invasion.